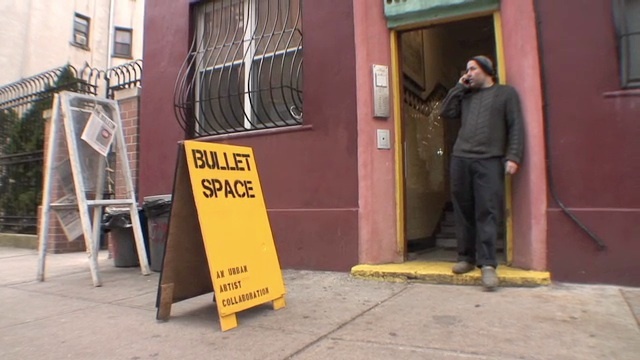 Located at E. 3rd Street / Loisada, BULLET SPACE is an act of resistance. A community access center for images, words, and sounds of the inner city. The center was founded in the winter of 1985 and was part of the squatter movement and reconstructed with or without the formal sanction of the city, invisible officialdom. The ground floor of the building is open-like, a bulletin. 'Bullet' first originated from the name brand of heroin sold on the block, known as bullet block, encompassing the accepted american ethic of violence; 'Bullet Americana' - translating that into the art form as weaponary. ABC No RIO is a collectively-run center for art and activism. We are known internationally as a venue for oppositional culture. ABC No RIO was founded in 1980 by artists committed to political and social engagement and we retain these values to the present. The space became available after the squat of a storefront building on Delancey Street, what known is as 'The Real Estate Show', where artists showed their work and performances for one day in 1979. Joseph Beuys was among the many visitors attending the show. Our community is defined by a set of shared values and convictions. It is both a local and international community. It is a community committed to social justice, equality, anti-authoritarianism, autonomous action, collective processes, and to nurturing alternative structures and institutions operating on such principles. Our community includes artists and activists whose work promotes critical analysis and an expanded vision of possibility for our lives and the lives of our neighborhoods, cities, and societies. It includes punks who embrace the Do-It-Yourself ethos, express positive outrage, and reject corporate commercialism. 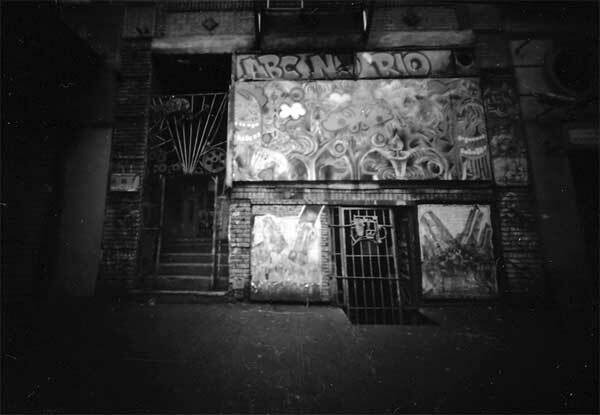 It includes nomads, squatters, fringe dwellers, and those among society's disenfrachised who find at ABC No Rio a place to be heard and valued. Schijnheilig is a nomadic collective dedicated to claiming neglected spaces and transforming them into creative, freely accessible and non-commercial places for people to meet. Our activities include visual arts, music, theater, poetry, lectures as well as everything that emerges within and around such creative practices. Squatting is part and parcel of the history and development of Schijnheilig. For Schijnheilig, squatting is a political act, signaling housing shortage and the waste of abandoned space. At the same time we want to show that you can make a positive contribution in the city by using empty spaces in buildings that are otherwise simply left to waste away. Even more so, for Schijnheilig, squatting is part of an attitude that does not automatically accept the status quo (regarding authorities, commercial organizations and urban development). 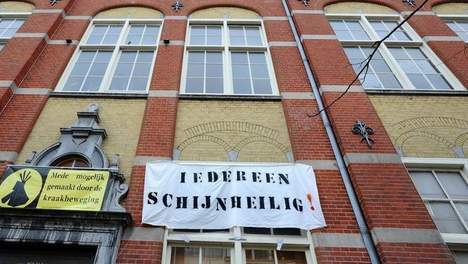 In January 2010 Schijnheilig squatted a former school building at the Passeerdersgracht 23BG, in the heart of the Amsterdam â€˜entertainment areaâ€™. The renovated space we have reclaimed is equipped with a stage room, an exhibition space and a debate/cinema hall. Meanwhile, the building has become a buzzing meeting place for artistic, scientific and politically engaged people. On October 1979 Warmoestraat 139 was squatted by Guus van der Werf, Marianne Kronenberg, Martha Crijns, Reinout Weydom and Ad de Jong. They needed a place in their hometown to show their artworks and those of their friends, showcase bands, and do performances. For the first ten years, the huge spaces of W139 were a free state, which were run by a series of artists collectives. Ad de Jong, as first director, with Kitty van Roekel decided that W139 should be about change and the energy of artists. This developed in the idea of appointing a new director responsible for W139's artistic policy for the relatively short period of two to four years. Now the director is supported by a staff of five employees, some interns, freelancers and volunteers. So far, W139 has hosted little more than 450 shows by more than 1700 artists, which have attracted roughly 10.000 visitors a year. Thanks to the unremitting dedication of many, W139's do-it-yourself mentality has been instrumental in buying, expanding and renovating our building. Renovation of the building in 2005 was an absolute necessity. The previous owners had put minimal effort in the building, just enough to keep it standing. The local authority had not enough money to finance the renovation of the premises, so the question arised: can we do it ourselves? We have always seen that as an opportunity and answered yes.â€ Because W139 saw it as an important step towards and autonomous functioning they acquired the building. The financing took place by way of an estimated 50% financial aid and 50% bank loans. Eventually the construction took 15 months. W139 wants to function as autonomously as possible but wants to pay attention to the surroundings. The Warmoestraat is a rough street, just around the corner from the Red Light District, Dam Square and worlds first Stock Exchange, where local residents, business people, prostitutes, junkies, students and tourists walk through. During centuries there have been little changes made to the exterior of the area, the ˜Blaauwlakenblok, the premises are very close to each other. W139 has, so to say, constructed a new box in an old existing box. The entrance has become much more open and invites to come in. The interior of the new spaces have been fitted with new soundproofed walls, so artists can not only work during the day, but also at night and, apart from a section of the wooden roof construction, everything you see in W139 is new. 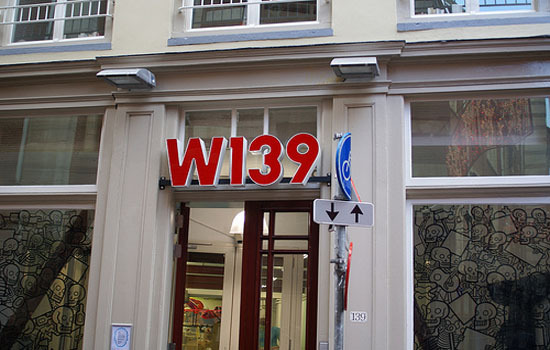 During the years, W139 established itself as the kingpin for contemporary and experimental art in Amsterdam. Since 1979, it is a space for continuous production and presentation of Contemporary Art. Dedicated to risk and experiment, they show eight to ten exhibitions a year organize readings, concerts, performances. Since its establishment, shaping a new, living unity between works of art, space and public became the mission. These buildings were taken over sparked by the necessity to showcase experimental art, music, theatre, performance, readings and exhibitions. Free, autonomous zones are of great importance since, in absence of external rules and high rents, interesting and unexpected expressions and perspectives come into existence.